I am looking forward to the season finale of The Flash next week. This season, they finally got away from the big bad being yet another speedster and went with The Thinker instead, and it has been pretty solid so far. I do hope they find a way to resurrect Elongated Man, who was taken over by the villain a few episodes back, I was really enjoying him on the show. The series might not be perfect, but it does a much better job of bringing The Flash to life than the Ezra Miller Justice League movie version did. One of the things I enjoy about Barry Allen is that he's pretty stable. He's smart, has a pretty cool job as a CSI/Police Forensics and he was married. Happily married. I don't enjoy "slow" being called "slacker". Ezra Miller's Barry Allen seemed lost and confused by his father being in prison. Unemployed. I don't get it. I don't understand why there is such a great divide between the television and film "universes". @AirDave because a lot movie studio execs and big wigs are stupid. That's the short answer. Brilliant, beautiful cover as always Ross. Hell with the Flash's speed, why couldn't he simply just super-strip the Sentinels into scrap before anyone has to die? That Flash costume is STUPID. First scene in Flash movie if ever made is Barry talking to Bruce about a great idea for a new costume but he cannot afford the equipment & materials to make so Bruce funds you. I don't know. This season, the soap opera elements of THE FLASH have made the stories less riveting for me. And a live-action Ralph Dibny has proven to be the world's first _uncomical_ relief! Maybe I'll change my mind if I watch the On-Demand repeats back to back. I remember when the Legion of Super Heroes briefly teamed up with the X-men of DOFP in one of the "Access Trilogy" limited series from DC and Marvel. And, for me, those two super-groups cliqued! It's a shame that the Big Two never did a full-length crossover special starring the LSH and X-men. Even if not as an expansion of/sequel to that cameo. P.S.---Who says you can't get a cab when you need one? @Dale and Air Dave: the slightly longer answer is that they stupidly think themselves too good to just copycat what's depicted in the comic books. They want to prove how "creative" they are by imprinting minor variations on to the backstory of each character (major and minor). I haven't yet seen either Justice League or the current season of The Flash, so I know little about what's going on; what I do know is based on trailers, promotional photos, a commentary such as what I see here, notifications on the Emergency Awesome channel on YouTube, and similar sources. 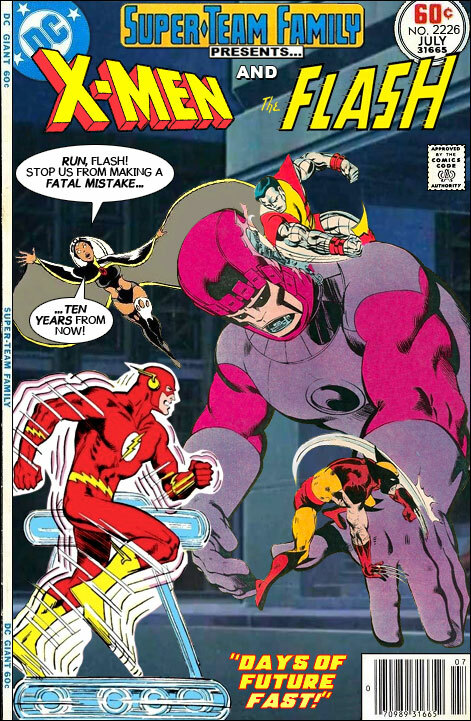 Thus, I speak on the comparative Flashes -- Gustin vs. Miller -- will somewhat less authority than the rest of you. That said, I do feel that Ezra Miller, though a quite good actor in general, was a poor choice for Barry Allen. In the comics, Barry was/is a police chemist, as he is on the TV series. The insistence on doing "something fresh" with popular characters and stories is ruining many otherwise great properties. Minor changes and twists (such as using African-American actors for the TV West family, putting Barry in their house as a foster brother, and such) can be good, but wholesale changes can make a mess of things. On the topic of Big Two crossovers, I do wish they'd continued to make those. The Marvel vs. DC, JLA/Avengers, and other crossovers made for some very interesting stories. Heck, if Warner Brothers can fix their mess-ups with the Justice League -- and if the needed characters can somehow be drawn all into one place -- I'd welcome a big-screen JLA/Avengers treatment. Bob Greenwade -Ezra Miller might've made a good Impulse. jackel - I agree that the particle accelerator was a good element for the CW's show. It gave a good explanation for the sudden emergence of metahumans, kept the original origin in good standing for tradition's sake, worked around how we now know that said original origin couldn't work that way, and even allowed for further new metahumans with different origin types later on. Heck, it even made for a good tie-in with Firestorm's origin. mw - Ezra probably would have made a very fine Impulse. I think I might prefer him as Beast Boy/Changeling, though. PS: For some reason it looks to me like Barry's running backwards in this pic. Maybe he was in the original art...? Hey anonymous--you think The Flash is a soap opera? Tune in Supergirl? I sent a request to the producers: "Less soaper, more super!" @JH3: yes, I have. But, there are a lot more super-fight scenes to prevent the same over-abundance of over-drama. THE FLASH needs similar balance; y pronto! I have to agree with Anonymous on this one. Ezra Miller's version of Barry Allen was refreshingly less maudlin than Gustin's televersion, this season.